Zhuhai. Located in China near by Macau and Hong Kong. My flight landed in Hong Kong International Airport after six hours journey from KLIA. Actually a story about China, it's like an ancient story, but suddenly i just remembered the sweet times when i was there. Al maklum la kali pertama pergi overseas (My first time travelling to overseas). When i reached at Hong Kong, the weather was cold, i think it was around 5 degree celcius. Muazzam said he's not gonna be in Hong Kong waiting for me because i've got accompanied by a companymate. But he lied, he was there and grinned! Surprise la kononnnn....but i wasn't shocked anyway! From Hong Kong to Zhuhai, we took a ferry. 45 minutes later we reached Zhuhai. Shenzen and Guangzhou. I went both places. Shenzen is a big city and Guangzhu too. I will share my moments in Shenzen and Guangzhou with you, maybe some other time. 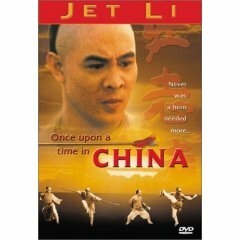 That time i wish i could meet Jet Li you know...., but last night he was in my dream saying that he will be my Bodyguard From Beijing!